What with all the hubbub of the Triple Crown and launching of Hello Race Fans, General Quarters rolled right under the radar! Not only his a newly minted Omnisurface Star with this thrilling win the Grade 1 Woodford Reserve on the Kentucky Derby card, he’s an ALL GRADED Omnisurface Star on the verge of joining Lava Man as an all Grade 1 winner if he pulls off a win in the upcoming Stephen Foster on dirt! We’ll be rooting for him, and in the meantime we’ll get a page up for him. Be sure to check out the Won on all 3 tab as well. It was reported yesterday that Einstein sustained a soft tissue injury while training for the Gulfstream Park Handicap and was retired. He’ll stand at Adena Springs in Paris, Kentucky where he’ll hopefully create many more Omnisurface Stars! 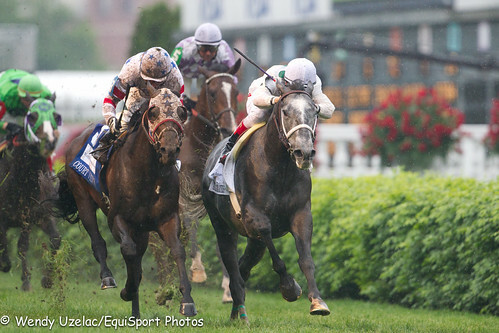 Also reported yesterday was that Zenyatta will race again in 2010. While we can’t imagine that it would happen, we’d love to see her try turf given that she’s already a G1 winner on dirt and synthetic! 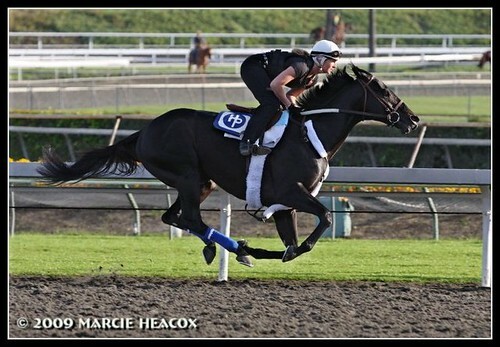 Mike Welsch has a piece at DRF today about Einstein remaining in training. …the finalist for an Eclipse Award in the older male category for 2009 was standing in his stall in Barn 9 at Gulfstream, where he remains in training for a potential start in the Grade 1 Gulfstream Park Turf on Feb. 6. And there’s more good news for fans of Einstein, it looks as though if things go well in the Gulfstream Turf he may continue racing in 2010. Jack Brothers, who handles the season sales for Adena Springs, said on Saturday that the farm is still uncommitted as to whether Einstein will stand at stud or continue to race in 2010. Fingers crossed for an excellent return for Einstein, we’d love to see him get another shot at G1 on dirt! Mine That Bird, Omnisurface Star? © 2019. Omnisurface Stars. All rights reserved. Powered by WordPress & SimpleX theme.